The CEO has suggested shooting environmentalists in the past. The war on plastic has just gone aerial. By 2023, the Irish airline Ryanair plans to eliminate plastic aboard its flights as part of a broader move toward sustainability, according to a press release. 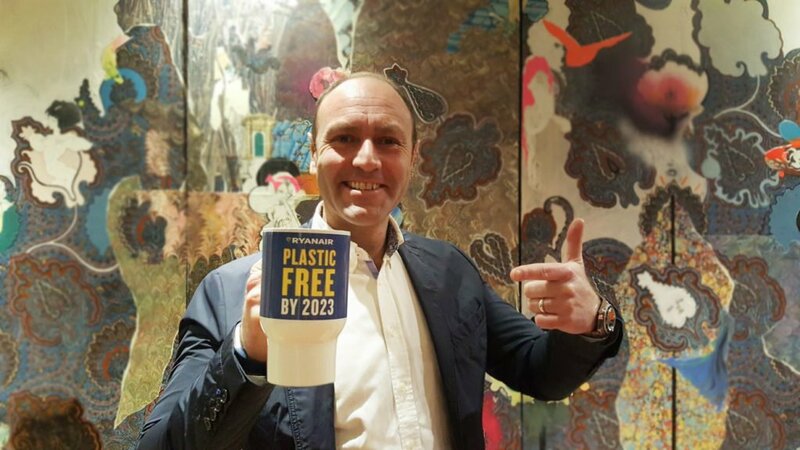 “We are very pleased to announce our environmental plan which includes our commitment to eliminate all non-recyclable plastics from our operations over the next five years,” Kenny Jacobs, Ryanair’s chief marketing officer, said in a press release. Take Action: Pledge to Become an Ocean Guardian by Ditching the Disposables and Investing in Reusables. “For customers on board, this will mean initiatives such as a switch to wooden cutlery, biodegradable coffee cups, and the removal of plastics from our range of in-flight products,” he added. The transition means that Ryanair will have to find replacements for a wide range of good and services, including for food and drink and safety protocols. Ryanair operates 600,000 flights a year, so while each individual flight may not lead to a major reduction in plastic use, the overall impact could be meaningful. Globally, around 380 million metric tons of plastic are being created annually and 75% of all plastic is simply thrown away to pollute the environment. Meanwhile, an estimated 8 million metric tons of plastic enter the oceans each year, which is like emptying a garbage truck of plastic into an ocean every minute. Other companies have announced plans to cut plastic from their operations. For instance, McDonalds recently vowed to make all packaging sustainable by 2025; consumer goods conglomerate Unilever aims to make its plastic packaging recyclable by 2030; Lush Cosmetics aims to use as little packaging as possible for its products; and numerous UK supermarket chains are trying to go plastic-free. Ryanair’s commitment comes as a surprise to some because of CEO Michael O’Leary’s past comments on the environment, the Guardian reports. He has frequently denied climate change and even suggested shooting environmentalists, according to the Guardian. And that past makes the brand’s other announcement even more surprising. Now customers can choose to donate to carbon offset programs when booking flights because, after all, flying is one of the leading causes of carbon emissions in the world. Global Citizen campaigns on pursuing renewable energy and curbing fossil fuel use. You can take action on this issue here.